Tough soils and drought conditions are common conditions in the American West and often make it hard to establish some of our favorite non-native trees and shrubs. When farmers and gardeners find trees and shrubs that establish easily and achieve our goals of shade, erosion control, or windbreak establishment, we plant them everywhere. Unfortunately, some of the easiest to establish non-native plants are also the most likely to become invasive and displace native habitats. One such tree is the Russian olive. Fortunately, there are non-invasive alternatives to the Russian olive. Native to southern Europe and western Asia, Russian olive's earliest known use in cultivation is around 1736 in Europe. 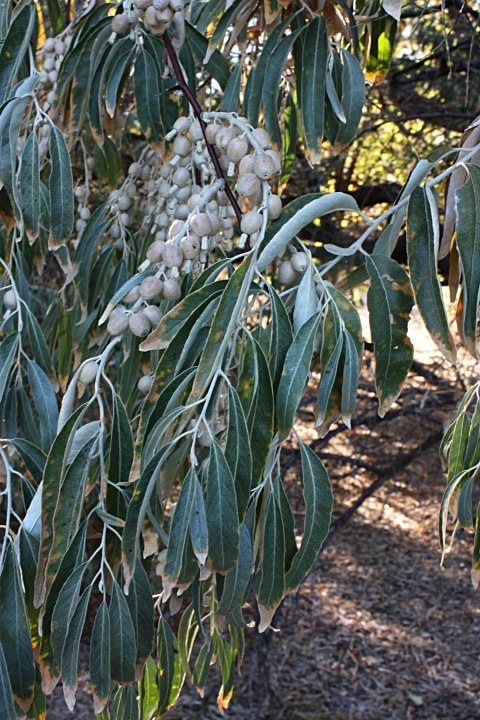 Russian olive (Elaeagnus angustifolia) was introduced to the United States from Europe in the late 1800's for ornamental use and as a tree ideal for windbreaks. Russian olive proved to be an easily established tree conducive to mass planting for windbreaks so it was widely used in almost every state of the Union. Russian olive is a very competitive plant and crowds out native cottonwoods and willows along many of the rivers and streams in the western United States. For many years both wildlife managers and land managers believed Russian olive provided food and cover for birds equal to that of the native cottonwoods and willows it was replacing. Recent studies do not support this assumption. This has led a number of western states to list Russian olive on their noxious weeds lists and various state and federal agencies to initiate Russian olive eradication projects. Birds will eat Russian olive fruit and poop their seeds out miles from where they consumed the fruit. This makes the spread of Russian olive trees difficult to control. Don't be surprised if someday you notice a Russian olive tree trying to crowd out some of your more precious trees or shrubs because the seedlings tolerate both continuous shade and extreme sun. If germinated under the canopy of established trees and shrubs, Russian olive seedlings can go unnoticed until they are large and hard to remove. The best strategy is to do a good job of weeding around your trees and shrubs and be very vigilant. Nurseries in states listing Russian olive as a noxious weed cannot sell them but other states may still sell them. Even if you live in a state that has yet to recognize Russian olive as a noxious weed, it is best to choose other trees. A number of native and non-natives trees and shrubs substitute for Russian olive and they will not take over your yard or nearby native habitat. What species to replace Russian olive with will depend on your climate and soil. In California, some choices are crepe myrtles, desert willows (Chilopsis linearis), and eastern redbud just to name a few. For homeowners in the high desert, skunk bush sumac, silver buffalo berry, and ash make good substitutes for Russian olive. In much of the Southwest, desert willows (Chilopsis linearis) are native and a nice substitute for Russian olive. To find the best substitute for Russian olive in your yard visit a local botanical garden, arboretum, or your county Extension. We gardeners may have been a part of the problem but we can also be part of the solution to restoring native habitats by not planting known noxious vegetation and keep noxious plants from establishing in our own yards. 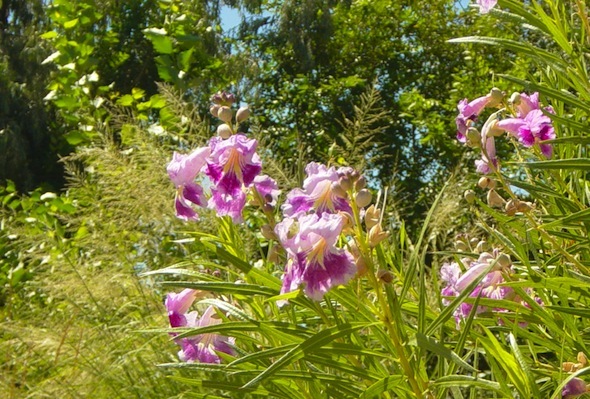 Try planting some of our lovely native plants to replace some of aggressive introductions that threaten our wild lands.